This is a picture of E.B. 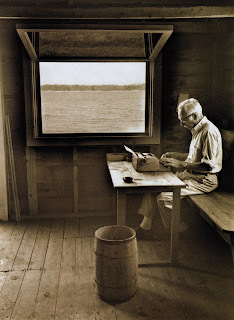 White, best known for his books Charlotte's Web and Stuart Little, in his boathouse, Allen Cove, Maine. 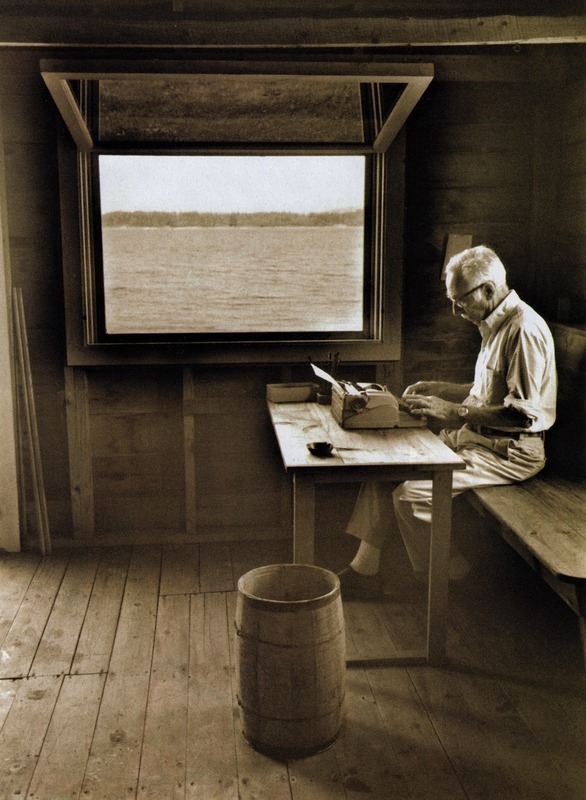 This room is honed down to just what is essential...the soulful character of the wood, a surface on which to write, the inspiration of the view, and his typewriter. I'm not sure what the wooden barrel is for...maybe for trash. The picture was taken by Jill Krementz. What an incredible picture. Such simplicity. My favorite photo of E. B. White! Thanks for posting such a high-quality reproduction of it -- which I just shared with one of my writing classes at CityU of Seattle. I think this is the painting William Zinsser mentioned in On Writing Well. Thanks for posting it! Love it!